The Canada Border Services Agency (CBSA) provides integrated border services that support national security and public safety priorities while facilitating the legitimate flow of people and goods. To fulfill this mandate, the Government of Canada has developed a legislative and regulatory framework that results in a strong working relationship between the CBSA and the Royal Canadian Mounted Police (RCMP), Canada’s federal police service. This framework clearly delineates the roles and responsibilities of the CBSA and the RCMP, and allows for effective cooperation on matters that fall under the responsibility of each organization. As a result, CBSA-RCMP cooperation is stronger and more efficient. In essence, the Canadian experience has demonstrated that an interconnected and interdependent world, with an increasing demand for greater security, requires Customs authorities to work effectively with their police counterparts. I was proud to deliver a presentation on this topic at the recent Customs meeting of the WCO Americas and Caribbean region in Bolivia in April 2016. The CBSA’s own history is founded on the principles of coordination and partnership with key stakeholders. In 2003, the CBSA was established as an integrated border management organization. Responsibilities related to the border were brought together, including those for Customs and revenue collection, immigration, and food plant and animal safety. The result is a single organization responsible for managing the flow of goods and people across Canada’s borders, administering over 90 different Acts and Regulations. One of the founding principles of the CBSA is that coordination across government, with a focus on the border, is essential, for both security and trade. The CBSA and the RCMP are partners under its portfolio head, Public Safety Canada, meaning that we report to the same Cabinet Minister of the Crown. Cooperation between our two organizations begins at the highest level, with the President of the CBSA in regular dialogue with her counterpart, the Commissioner of the RCMP. We recognize the important part that each organization plays; we have clear roles and responsibilities that delineate our interactions, and we strive for the greatest cooperation at the strategic, operational and tactical levels. In essence, the CBSA has primary responsibility at ports of entry, while the RCMP is responsible for everything that takes place between them. In addition, we hold joint executive meetings and regular operational discussions, and have day-to-day interactions at the regional and local levels. One of the most important examples of cooperation is our Joint Working Group, led by CBSA’s Vice-President of Operations and her counterpart at the RCMP. Through this working group we are able to share information and review joint forces operations. In environments requiring long term Customs-Police cooperation at the local level, a formal agreement covering this collaboration is required to clearly set out guidelines through what is known as Joint Forces Operations (JFO) agreements in Canada. Recently, a JFO consisting of some 700 Customs and police officers were mobilized during a major operation against a criminal network involved in tobacco smuggling, drug trafficking, and money laundering. Seizures from this operation of tobacco and narcotics were valued at approximately 5.3 million Canadian dollars. This joint operation took place simultaneously in six countries located in North and South America, as well as in Europe, and resulted in the arrest of approximately 60 individuals linked to organized crime. Over the course of the operation, this criminal organization allegedly smuggled at least 158 loads of tobacco, which represents a fraud of over half a billion dollars (530 million) to the Canadian federal and provincial governments through the evasion of duties and taxes. The dialogue extends to day-to-day interactions at the local level. For example, this past January, Customs officers at our busiest airport, Toronto Pearson International Airport, found 110 kg of cocaine. In these instances, the narcotics are turned over to the RCMP for further investigation that may include a controlled delivery. Internationally, we also work together with our federal police counterparts to leverage respective strengths and resources. For example, our International Liaison Officer network, consisting of 44 officers in 32 countries, collaborates regularly with our federal police counterparts to review issues impacting operational effectiveness, in order to protect Canada’s borders from abroad. Since the creation of the CBSA in 2003, we have signed over 120 agreements with the RCMP on an ad-hoc basis. In 2012, the senior management at both the CBSA and the RCMP agreed that a new, overarching Memorandum of Understanding (MoU) with seven subject-specific annexes should be developed to consolidate and replace the 120 existing agreements between the two organizations. Signed in early 2014, this new umbrella MoU, enhances national consistency in CBSA-RCMP interactions, clarifies roles and responsibilities, and allows for a consolidated point of reference for staff. 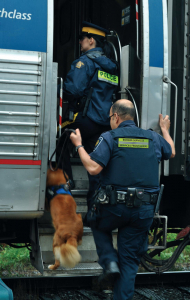 The CBSA and the RCMP signed a Statement of Cooperation in July 2013, which describes a desire for both organizations to work towards greater cooperation at the strategic, operational and tactical levels. To solidify this commitment, the first Joint Border Strategy was adopted in April 2015 and distributed publicly on various websites. The strategy is meant to facilitate collective discussions on jointly identified issues, including formalizing working relationships for collective priority setting and planning, enhancing information and intelligence sharing, leveraging existing infrastructure, and formalizing training and secondment processes. Building a strong and fluid relationship with a country’s police service is not always easy. An efficient cooperative relationship needs to overcome obstacles, such as differing organizational cultures/interests, legislative barriers, technological complexities and funding, to name a few. Throughout our experience in building the relationship, it became clear that open and fluid communication between the two organizations is critical. Success factors include political will, and a clear definition of our respective roles and responsibilities for jointly ensuring the safety of Canadians. In this way, the return on investment can be quite significant, resulting in better positioning for both Customs and police to achieve their joint mandate. While there will not be a ‘one-size-fits-all’ blueprint for countries to adopt, a concerted effort to consolidate border functions and develop an efficient framework for Customs-Police cooperation is critical to strengthening border management, which requires a balance between facilitation and security measures.